For decades, the nation's largest automakers were referred to as the "Big Three," signifying their dominance not only in the U.S., but worldwide. In recent years, though, as Ford Motor (F), General Motors (GM) and Chrysler Group have struggled to maintain global dominance, a new moniker has emerged: the "Detroit Three." "I think 'Big Three' fell out of favor because GM, Ford and Chrysler were shrinking rather quickly these past few years," notes John Neff, editor-in-chief at Autoblog, a sister site to DailyFinance on AOL. Toyota Motor's (TM) growth in the U.S. market allowed it to surpass those of Ford about three years ago and then overtake GM in worldwide sales in 2009, Neff says. "So calling them the 'Big Three' didn't quite fit anymore." The recent financial crisis and recession only made matters worse, dragging down sales, forcing GM and Chrysler into bankruptcy reorganization, and compelling Ford to mortgage nearly all its assets to muster a turnaround. Out of the tough times, "the domestics," as Neff also calls them, have emerged stronger, better able to turn a profit while selling fewer vehicles. The slowly recovering economy has helped, too. Ford, GM and Chrysler each recorded higher sales in 2010 than in 2009, one of the worst years in decades. Some of that sales growth, especially in Ford's case, came at the expense of Toyota, which stumbled throughout much of the last year as it struggled to deal with numerous safety recalls that damaged its reputation and led to record fines by federal officials. 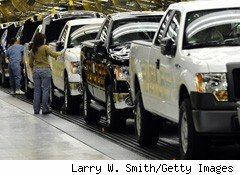 Of the Detroit Three, Ford is in the best shape, says Arthur Wheaton, auto analyst at Cornell University's ILR School in Ithaca, N.Y. "The auto industry is cyclical not only in sales, but it's also cyclical in terms of who's having momentum -- and momentum makes a big difference," Wheaton says. "It's the perception more than the actual car itself." Unlike its crosstown rivals, Ford has benefited in part because it didn't submit to a government-sponsored bailout. Instead, the Dearborn, Mich.-based company took on massive debt, betting on a turnaround plan that reduced its number of divisions and focused on the core Ford brand. So far, the restructuring, under the guidance of CEO Alan Mulally, has worked well. The perception that Ford in essence pulled itself up by its bootstraps is one that appeals particularly to Americans' "can do" attitude, Wheaton says. GM, by contrast, has been labeled "Government Motors" by some detractors for its government bailout, alienating some potential customers. GM is eager to ditch that image, but it won't be easy as long as U.S. taxpayers still own a sizable chunk of the company. GM's initial public offering in November reduced the Treasury's stake in the automaker to about 32%, substantially less than the 62% it used to own. But it'll still be some time -- perhaps years -- before the government offloads all its interest in GM. Further aiding Ford's position is that it has a two-year head start on GM and Chrysler in product development. While GM and Chrysler were working through their bankruptcies, Ford was designing new models and moving ahead with plans to improve its business. GM's newly named CEO Daniel Akerson has acknowledged his company's challenges, saying there is a gap in the product pipeline caused by what he called a lost year due to the bankruptcy. To remedy the problem, Akerson this week named Mary Barra as global product development chief, a title once held by automotive legend Bob Lutz. Barra, the first woman to hold the post, will oversee product development for GM's 11 brands worldwide -- and, as USA Today notes, her mandate will be to make it happen faster. Though GM may be lagging in bringing new models to market, it does have an advantage over Ford in China, where GM is a dominant supplier. Cornell's Wheaton says it could be argued that GM's dominance in China allowed the company to emerge from bankruptcy. "That's what made them a viable company," he says, noting that GM sold more vehicles in China last year than it did in its home market. Chrysler, too, faces a gaping hole in product development. The company unveiled a new Jeep Grand Cherokee midsize SUV last summer and will soon begin selling the tiny Fiat 500 subcompact. But the majority of its models are holdovers that have been part of the company's lineup for years. Continuing to build on last year's sales momentum and growing market share will be key the Detroit Three this year. But the domestics face additional challenges including negotiating new contracts with the United Auto Workers and rising gas prices, which could impede sales. Ford, GM and Chrysler have been able to recover in part due to steady oil prices that have made crossover vehicles and trucks desirable once again. If gas prices surge to more than $3.50 a gallon and stay there, however, consumers will likely begin looking for more fuel-efficient -- and less profitable -- alternatives. At last week's Detroit auto show, U.S. industry executives said they hadn't yet seen any change in the mix of vehicles in response to rising gas prices, The Detroit News reported. But according to Deutsche Bank (DB) analyst Jochen Gehrke, for 2011, "the main downside risk to profitability was cited by many as a further rise in oil price."